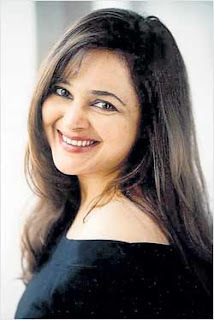 Mumbai, Dec 20 (IANS) Singer Alisha Chinai, with chartbusters like "Kajra re" ("Bunty Aur Babli") and "Tera hone laga hoon" ("Ajab Prem Ki Ghazab Kahani") to her name, thinks playback singing is ridiculous and says she can't do it any more at any cost. "Aishwarya and Katrina are beautiful women. But sorry, I didn't enjoy watching them pretending to sing my songs 'Kajra re' and 'Tera hone laga'. My God! It's so ridiculous! Would you ever see Julia Robert singing in Madonna's voice? Over here this practice of ghost voices just spooks me out, man. I can't do it, sorry," she said. Alisha's latest grievance over the tradition of ghost voices is the chartbuster "Munni badnaam hui." "Who knows it is sung by Mamta Sharma? Everyone sees it as Malaika's song," protests Alisha. "I've none. I can't fight the system. For years and years, the heroines have been walking away with the credit for songs sung by us playback singers. Today things have come to such a pathetic and sorry state for playback singers that no one knows the singers' identity any more. Who knows I sang 'Tera hone laga' for Katrina and 'It's rocking' and 'Bebo main bebo' for Kareena? In fact, many people think they sang these numbers!" she said. Alisha finds this continual neglect of playback singers degrading and thoroughly unacceptable. "I've told my manager not to even entertain any offers for playback singing. I can't do it. In the past, I saw Sridevi walk away with all the raves for my song 'Kaate nahin kat-te' in 'Mr. India'. It hurt then, it hurts more now. I'd rather sit at home jobless than allow my talent to be used to further any actress' popularity," a livid Alisha said. Alisha said she hoped to revive the era of non-film albums. "I know I'm being unrealistic, but I can't help it. Either I'll sing in non-film albums or otherwise let the singer also do music videos of songs that heroines lip-sync on screen. I know other singers just sing their songs, take the peanuts offered as remuneration and go home. I can't do that. I won't be exploited in this way. Pay me and give me my due credit. Or I am out of here," she said.